Jun Ho was only six-years old and this was his first train ride. Daddy couldn’t come, but Mommy said they were going all the way to Russia. Soo Mi took her only child by his hand as the train pulled into Pyongyang station. It would take eight days to reach Moscow and anything could go wrong in that time. She showed the forged identity papers to the conductor. It was unlikely her husband would suspect they’d attempt to escape this way. Her son was so excited as they took their seats. He giggled when the train started moving. They would never see North Korea again. Her long assignment as a sleeper agent was over. She was taking her precious boy and North Korea’s astonishing nuclear secrets back to the west with her. Her husband, a Major in the Korean People’s Army, would search for them in vain, or so she prayed. If they were caught before reaching safety, given what she knew, both Soo Mi and her little boy would be killed immediately. The North Korean military couldn’t risk the information getting out in the open. That’s why it was so important for Jun Ho and her to reach home. In 1963, a John le Carré novel was published called The Spy Who Came in from the Cold and later made into a movie starring Richard Burton. The novel had not been on Krista Bernham’s book shelf and the only reason Ian Dennis thought of it was the messages that flashed on his computer screen. He had sent out a coded query that anything having to with North Korea, nuclear weapons, high level assassinations, Kim Jong-um, and related topics trigger an alert that would be routed to him. Since this was, for the most part, internal information, he wasn’t fed details, but he was given a contact so he could further inquire. Her son was so excited as they sat in their seats. He giggled as the train started moving. They would never see North Korea again. Her long assignment as a sleeper agent was over. She was taking her precious boy and North Korea’s nuclear secrets to the west with her. Her husband, a Major in the Korean People’s Army, would search for them in vain. I wrote this for the What Pegman Saw photo writing challenge, with images provided by Google maps. Today, the pegman takes us to North Korea. The challenge is to use a single image as the inspiration for crafting a piece of flash fiction no more than 150 words long. My word count is exactly 146. 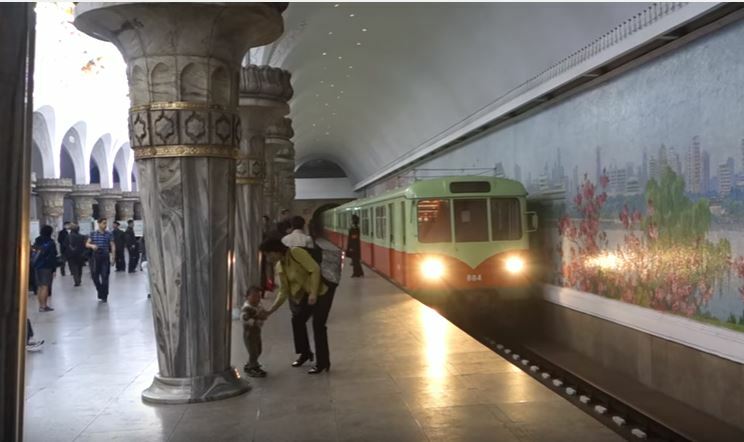 I took a peek at the image used by Rochelle Wisoff-Fields on her blog post response to the prompt (no, I haven’t read her story yet), and although I could have used another photo, I was captivated by the idea of traveling by rail in North Korea. I found out that there is a train that travels back and forth between Pyongyang and Moscow by way of Irkutsk. From there, I used North Korea’s nuclear threat to the world as a hook and my wee tale practically wrote itself.